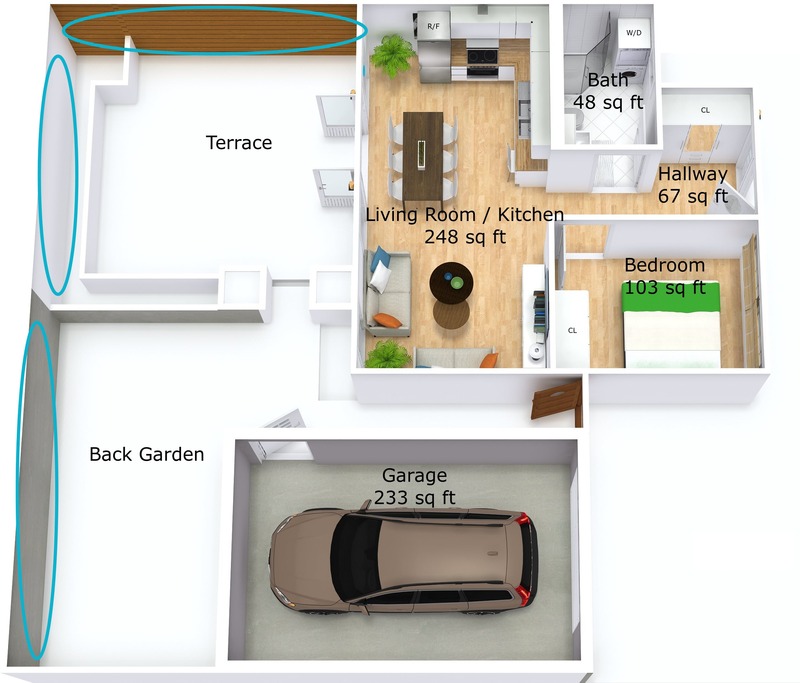 With a RoomSketcher Pro subscription, you can create impressive 2D and 3D Site Plans. Choose from lots of outdoor furniture, plants, and more to create landscape designs, garden plans, and backyard designs. In this article, you’ll learn how to create 3D Site Plans. To create 2D Site Plans, see: Create a 2D Site Plan. 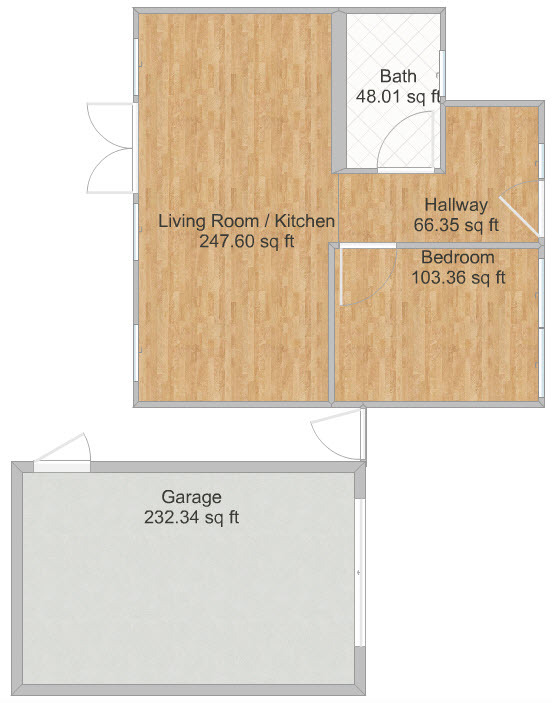 Create your floor plan as Level 1 in a project. Create a New Level and base it off of a copy of the Level 1. Tip: If you need detailed instructions on how to create a new level, see Work With Floors or Levels. There are two ways you can mark the outside perimeter of the Site Plan. 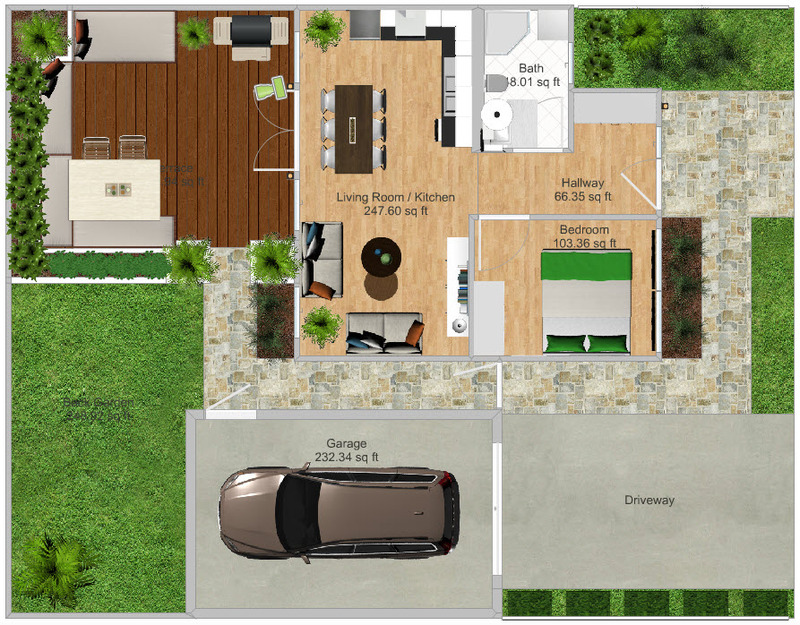 Use an Interior or Exterior wall if you want to see a wall on the 3D Site Plan. Use Draw Divider Line to mark the perimeter if you either don't want to have a wall or if you want to place a fence around the perimeter. You can use also use a combination of these as shown below. On the left, we have used an Interior wall for the backyard area, and on the right, a Divider for the front yard area. Open Walls mode (click the red Mode button and click Walls). Click the Draw Interior Walls button or the Draw Divider Lines button. Draw the outline for the perimeter. Make sure to draw a completely enclosed area. Tip: For more detailed instructions, see Draw a Yard, Garden, or Outdoor Area. To create a Site Plan that has different colored areas or zones, create them using Draw Divider Line. Draw zones (or areas) for your driveway, pathways, garden or lawn areas, deck, etc. 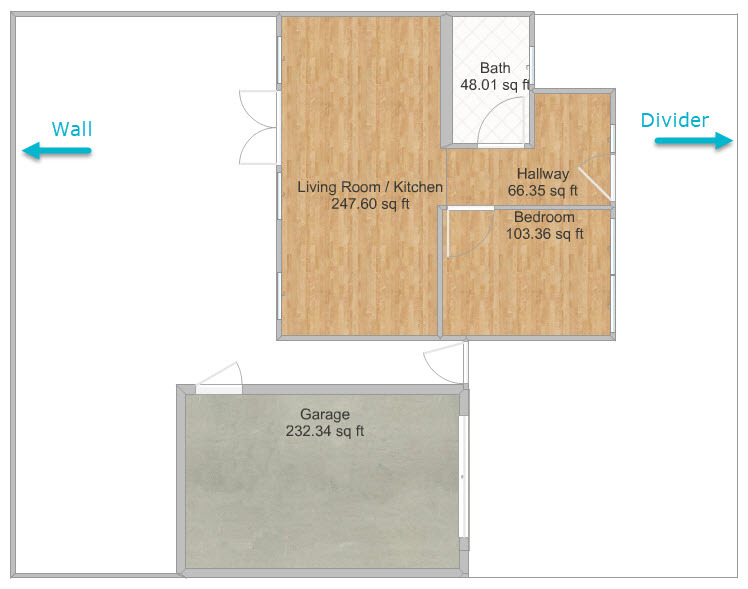 This allows you to display the various areas on the 3D Floor Plan, and add materials, names, and more. Click the Draw Divider Line button and draw any outdoor zones. Make sure to draw complete enclosed areas. In Walls mode, click the Select button, click a zone to select it, and its Properties appear on the right. Click Advanced Properties and clear the Show Ceiling checkbox. You can raise or lower zone heights - select a zone and click Advanced Properties. For example, in this project, we slightly lowered zones where we will put soil, as well as the Terrace area. 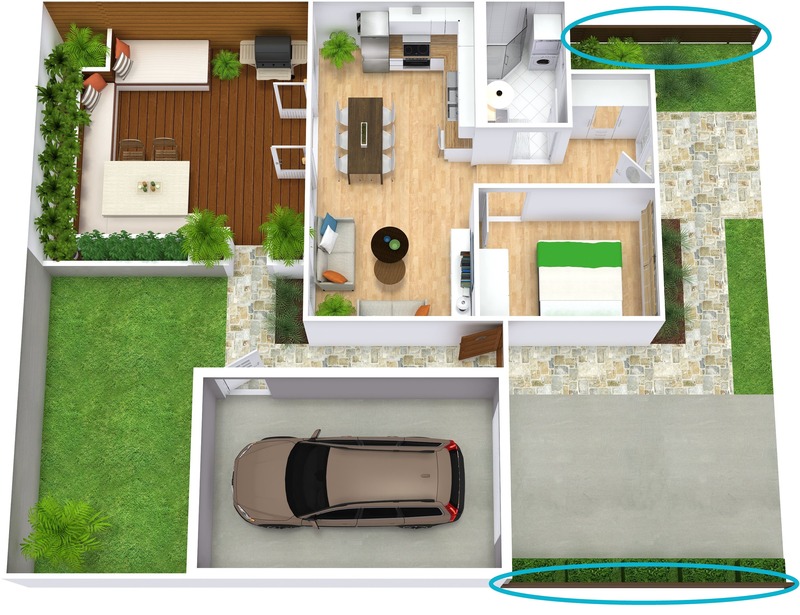 For detailed steps on how to change zone heights, see Change the Floor Height. Note: when you raise or lower the floor level of a zone, you create a “step” up or down to it that may need a material applied to it (or it will appear white on your 3D Site Plan). Select the zone the side is facing, and click Wall Material to add material to the side of the zone. White Paint on the back wall of the Terrace. Concrete on the Back Garden wall. Grey Paint on the Exterior Walls of the Garage. To add exterior wall materials, see: Paint and Decorate Walls and Paint, Wallpaper, or Tile a Single Wall. You can add material or color to your paths, decks, and plant areas. For example, you can add grass to lawn areas. 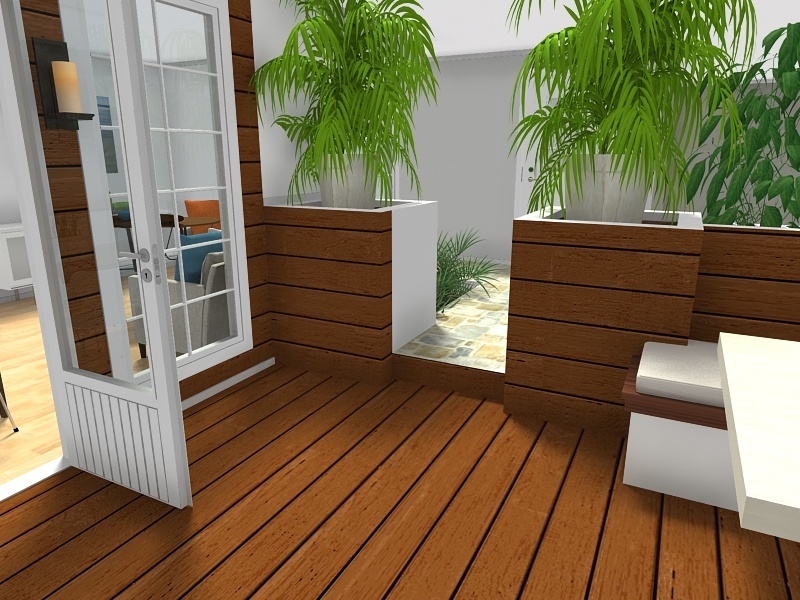 A deck or terrace can be a wood panel material. A path can be stone material or concrete. A planter area can have soil. Click to select a zone. Its Properties appear on the right. Click Floor Material. You can search for grass, soil, wood, wood panel, stone, concrete, and more. You can add plants, flowers, trees, hedges and more. You can also add a wide variety of outdoor furniture, umbrellas, outdoor sports equipment and more. Click or tap to select an item and click to place it onto the plan. - Click the + Add tab in the top-right to return to the library. - Close the Plants and Accessories category, and open the Outdoor category. You can add a fence or railing to any divider line. In our example, we’ve added a brown fence to either side of our front yard. Click the Select button, and click on a Divider line in your site plan. Its Properties appear on the right. Choose a railing. You can select picket fences, hedges, metal railings, and more. Tip: RoomSketcher Pro subscribers can add a Garden Gate to their fence/railing. See Add a Garden Gate. You can add zone names, labels, text and more. In the image below, we added zone names and sizes to the Back Garden, Terrace, and Driveway. We also added labels on the outdoor furniture. You can preview your site plan as many times as you want during the design process to make sure it looks good and to check that all your zone materials and labels are correct. 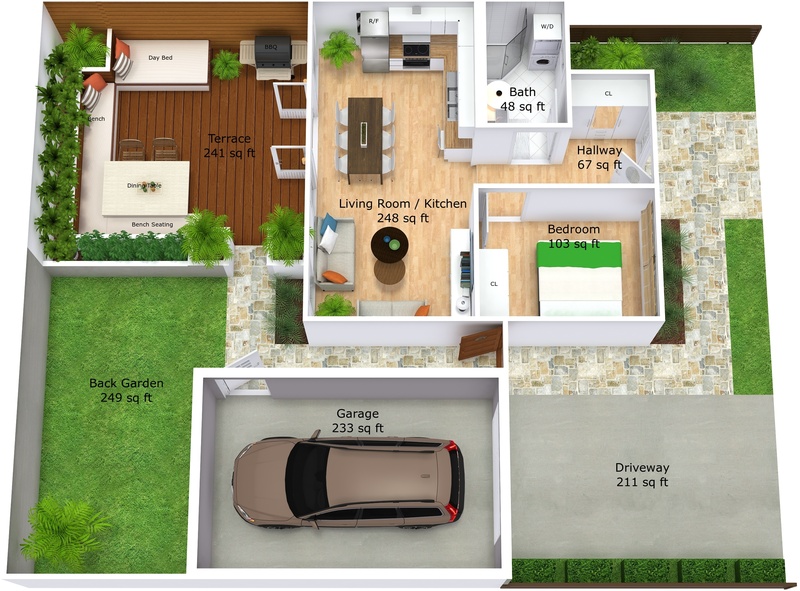 From the yellow Menu in the top left, choose Preview 3D Floor Plan. The final step is to generate and print your Site Plan. The steps are the same as generating a Floor Plan. 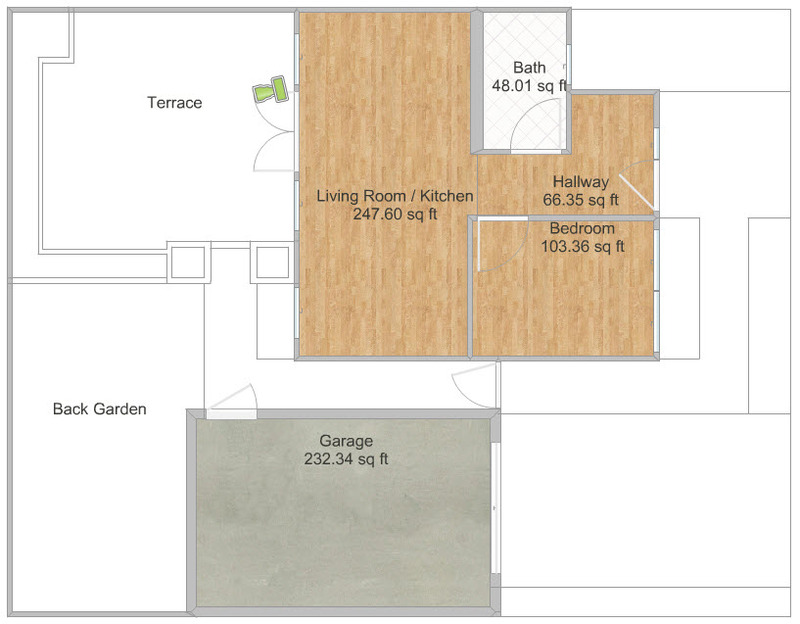 For detailed steps, see: Generate and Print 2D and 3D Floor Plans.